Note: this press release is a re-source that you may FREELY modify for use by your organization and/or as adapted for your locale. Enjoy. 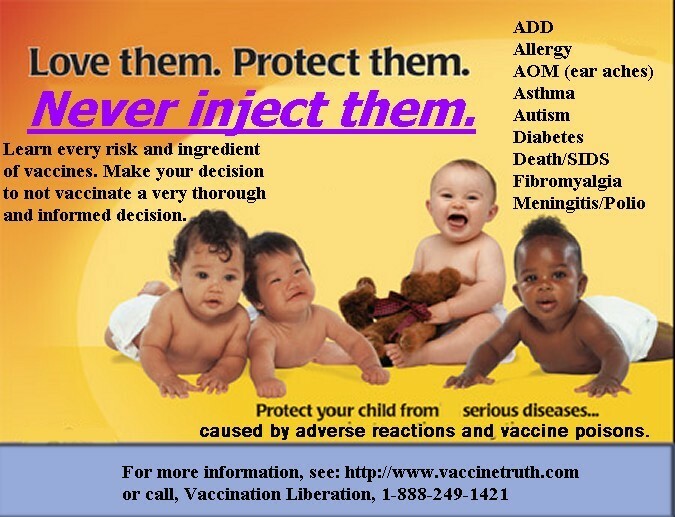 During this week, as public health departments celebrate the eradication of several infectious diseases as the alleged result of their mass vaccination programs, New Medical Awareness Seminars, The Autism Autoimmunity Project (TAAP), People Advocating Vaccine Education (PAVE), Vaccination Liberation (VacLib), and The Yurko Project have joined forces to educate the public about the known dangers of injecting such known carcinogens as mercury and formaldehyde coupled with pathogens cultured in genetic material of both human and animal origin directly into the developing immune systems of our infants and children. Even the Centers for Disease Control and Prevention (CDC) has admitted through their "Autism Alarm" that one in six children now have a developmental or behavioral disorder and one in 166 children are currently diagnosed with an autism spectrum disorder. What they fail to mention is the obvious cause of this nationwide epidemic: the dramatic rise in the number of vaccines the CDC now recommends, and many states require, for our developing children. To date, more than $1 billion has been paid out to families who have proven that their child suffers permanent disabilities or has died from a vaccine reaction through the National Vaccine Injury Compensation Program (VICP). But what is most tragic is the fact that less than 10 percent of families who apply through VICP ever get compensated. In 1990 the Vaccine Adverse Event Reporting System (VAERS) was set up as a national database where doctors and healthcare providers can report adverse reactions to vaccines. It is estimated that less than 10 percent of doctors report adverse reactions to vaccines to VAERS. Even with the small percentage of adverse reactions actually reported, the VAERS database speaks volumes of the relatively hidden epidemic of serious vaccine reactions, including permanent disabilities and death. The real tragedy is that there is no system in place to pull a "bad" batch of vaccine from the market. As a result, a batch of vaccine that may be severely contaminated will continue to be administered to our children. and Evidence of Harm: Mercury in Vaccines and the Autism Epidemic—A Medical Controversy by David Kirby — have given more than enough ammunition for parents to unite in collective outrage over current vaccine policy as dictated by the Advisory Committee on Immunization Practices (ACIP) at the CDC. Both Matsumoto and Kirby are award winning investigative journalists whose books shine a bright light on collusion and graft between the CDC, the Institutes of Medicine (IOM), the Food and Drug Administration (FDA) and pharmaceutical companies. What is most clear, and well—documented in these two books, is the lack of basic long—term safety studies performed on vaccines that are considered vital for public health and mandated in all 50 states. April Oakes, the President of TAAP, an advocacy group for parents with children suffering from an autism spectrum disorder, knows first hand the anguish of parents who know the cause of their children's suffering. "We want parents to realize they have options and the right to make an informed choice. No one knows our children better than we do and it's time to be their voice. We do not have 50 years to find the answers; our children are in a race against time. This epidemic is due to an immune insult and it's impossible to have a genetic epidemic. I wish someone would have shared truthful vaccine information with me before I chose to blindly hold my daughter Casi down while allowing her to be injected. Since Casi's passing, our lives have not been the same. I thank God for giving me the strength to survive and speak the truth. Our message is for parents everywhere: Do not become a victim, and learn from our mistake. Educate BEFORE you Vaccinate," April Oakes states with passion and conviction. Another poster can be found at the bottom of this page.